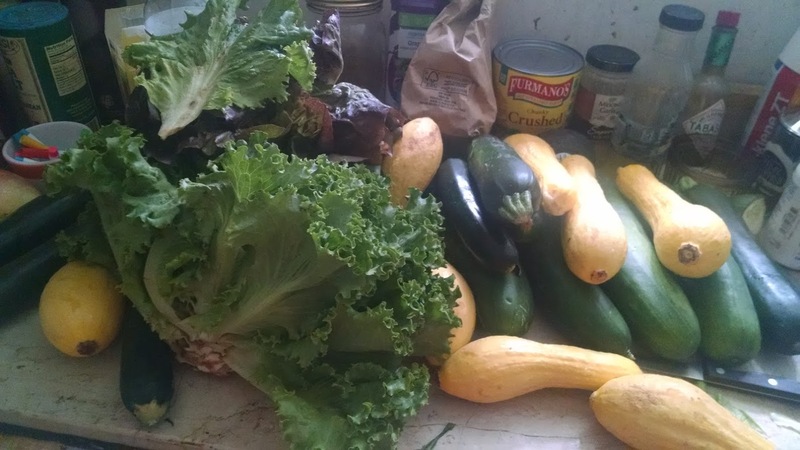 Remember my CSA, Porter Farms? I am back with them! Quietly P.F. and I have amassed quite a history. I seem to remember they got annoyed with me once years ago when I complained in the Buzz column that they gave us too much bad news. I complained on this web site too as I recollect. I do like to complain, something that Leonard Pennario and I had in common. But I love Porter Farms and they know it. I joined it again last year because they were delivering to The Buffalo News. The bags came in Thursday and it was a ton of fun. The newsroom would turn into an Amish market as produce was laid out on desks and coworkers swapped with each other or split shares. Kohlrabi would be held up and puzzled over. People were going around carrying huge bags of greens. This summer, since I took the buyout at the paper, I get my bag a few blocks away from my house. I am always in a hurry to go get it, always tripping over Howard and the cat. Then I come home and lay the contents of the bag out on tables and counters. Sometimes I take pictures of it, i.e. the picture above. Occasionally I paint pictures of it. Just today I found a half-done painting attempt and I remembered why I had not finished it. Dinner time arrived and I had to clear all the farm vegetables off the table. Another thing that makes the farm fun for me is, I do not want to know in advance what is in the bag. They send me emails and I am careful not to open them. I insist on being surprised! I was like that last year, too. Ha, ha! Three cheers for the farm that puts up with me. I guess between that and the aversion to bad news, I am not a CSA's ideal customer. But I am a faithful one! Hi Mary! I just saw your reply...two months later! Lol! I hope all is well. I have returned to Buffalo and WNED. I’ve enjoyed your drawings!